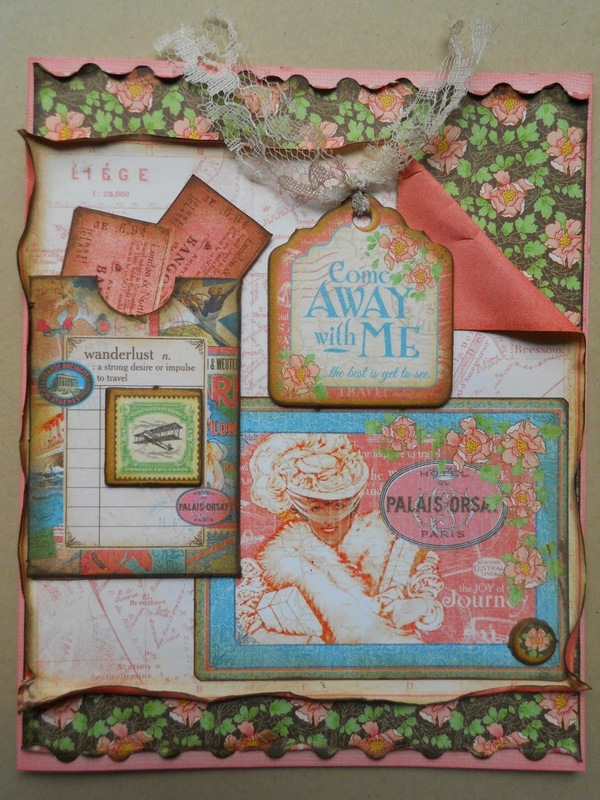 I made this vintage, travel card using the new Graphic 45, Come Away With Me collection, from FotoBella. How fun would it be to surprise someone with actual tickets to somewhere on the inside? 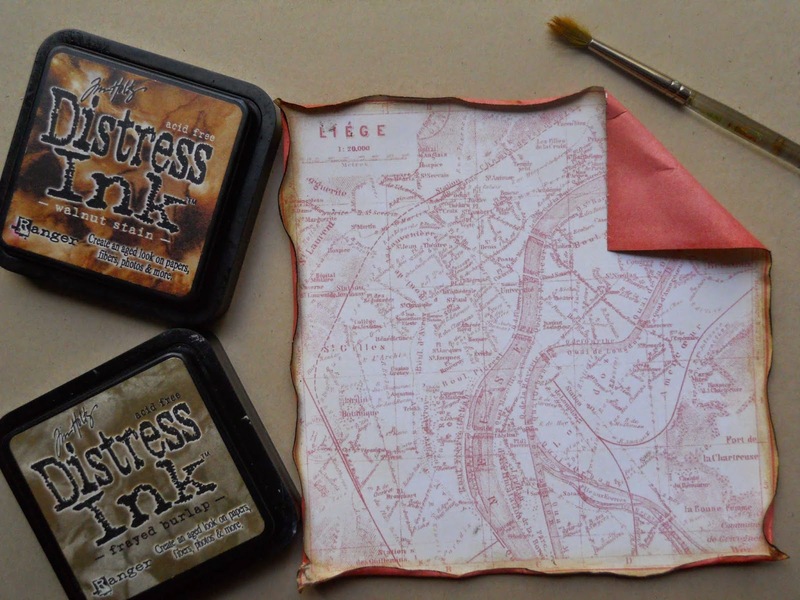 Take the pink map paper from the 6 x 6 Cardstock Pad and ink the edges with Distress Inks (Walnut Stain and Frayed Burlap). Using a paint brush dipped in water, go around the edges and lightly turn and distress your paper, taking the top right corner and folding it down a little. Fold and glue together the ticket pocket that comes in the Tags and Pockets. Use whatever image you'd like from the Jounaling and Ephemera Cards. 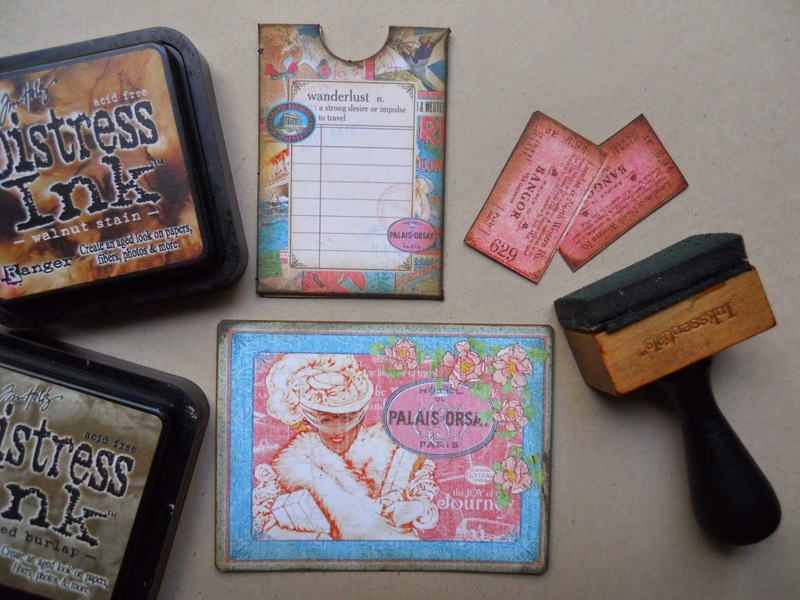 Cut the tickets from the 12 x 12 Cardstock Pad, and ink around all of the edges, as well as the pocket and Ephemera image. Now glue your tickets coming out of the pocket, and arrange them and your other items onto the map paper, as shown in the photo. I used the floral paper that comes in the 12 x 12 Cardstock Pad, to place behind the map paper, using decorative scallop scissors across the top and bottom. 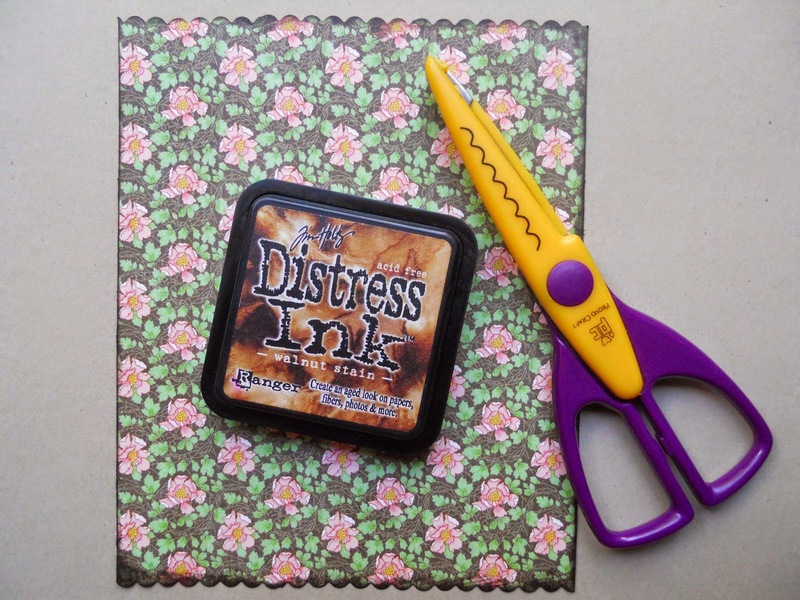 Ink the edges with Walnut Stain Distress Ink. To further enhance those scallops, wet the edges with water, and fold down every other scallop. After it dries, glue to your actual card, which I made out of light pink cardstock. 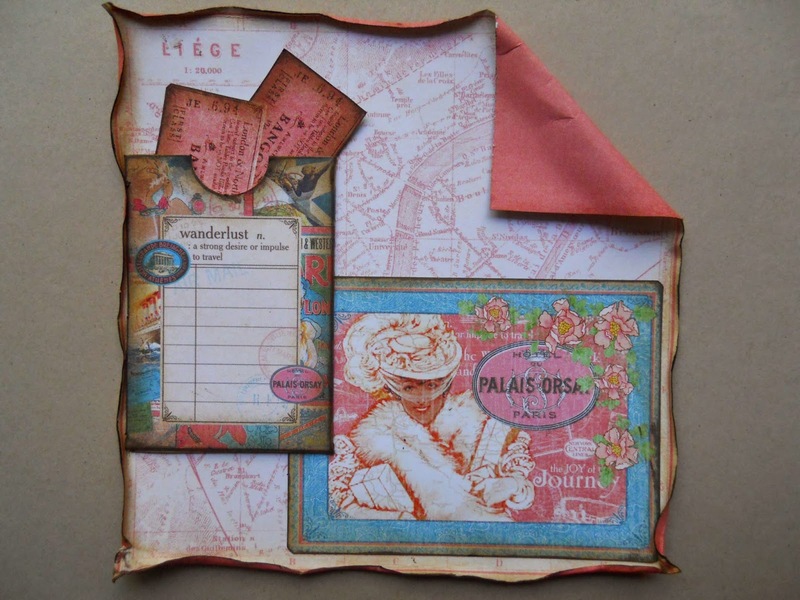 Now ink the edges of your chipboard pieces, using the same Distress Inks, and tie some lace or ribbon through the Come Away With Me tag. Arrange your pieces as shown in the photo. To finish it off just add flowers. 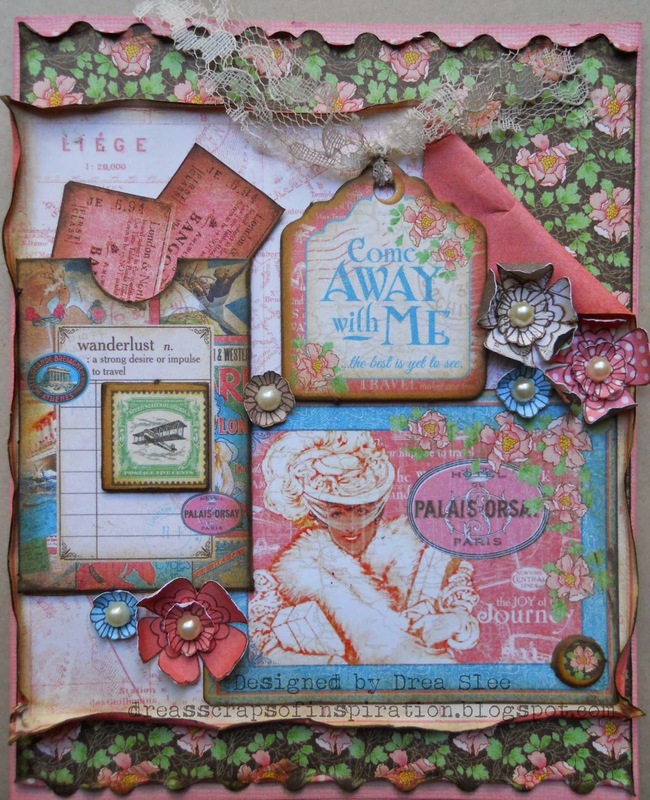 I stamped mine with a Prima stamp onto the patterned papers, and used pearls for the centers. Graphic 45 ~ Look Out World!